Things have changed in Kings Cross recently - and changed a lot. For those have been to (or through) the stations of Kings Cross/ St. Pancras in the last few years they will remember the slightly seedy, incredibly grimey area of a few years ago, and the gentrification of the developments of recent years - largely due to the modernisation of the now rather wonderful St. Pancras station and its importance as a hub for the Eurostar. The regeneration of the area has brought about many new and exciting developments, one of which I'm going to introduce you to right now. 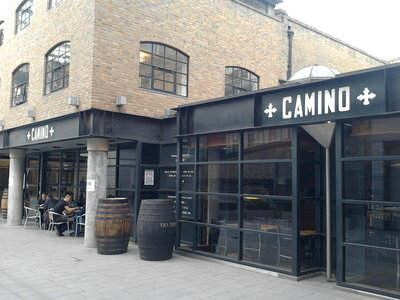 Camino is a juice bar, bar and restaurant, all located down a hidden alley in Varnishers Yard, literally a stones throw from Kings Cross station itself. The short walk to get there is deceptive though, as you actually feel, on entering the alley to Camino's, like you have just entered a different land - that of Spain. Camino aims to bring the best of regional dishes from around Spain, helping to link the best of Spanish food together (hence the name 'Camino' which means road in Spanish), and the focus is tapas, the famous small-plated food designed to be eaten while drinking. It isn't just food that is the draw here though, as this is a lively bar also, serving up drinks and good times in abundance. There is obviously a focus on wine, being one of Spain's best-known exports, but there are also cocktails and an impressive range of typical Spanish beers - including my favourite, Estrella, on draught. Weekends get lively too, with the evenings turning into near-full-on club nights, with largely Latin-playing djs spinning the best in exotic beats - from Samba to Bossa Nova, Salsa to Funk, so eat, drink and dance the night away before slowly following your own 'Camino' all the way back home.